With a total square footage of 4,066 and a finished floor area of 2,681 square feet, the Maple offers ample room for a large or growing family. This spacious but charming house plan includes a roomy garage that can accommodate up to 3 cars. The first floor has a combined kitchen and family area, a dedicated laundry space, and a combined living and dining room. 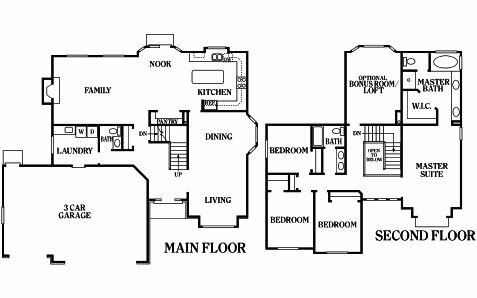 The 4 bedrooms, including the master suite, are on the second floor. There’s also a loft that can be converted into an extra room. The plan has a total of 2.5 baths that include a half bath on the first floor by the laundry area, a master bath with a walk-in closet, and a shared full bath on the second floor. With over 4 decades in the heritage home building business, Perry Homes Utah is a trusted builder of premium rambler and two-story homes. More than just offering beautiful house plans and constructing structures that will stand the test of time, we also provide various customization options that will make your home truly one of a kind. A design personnel will walk you through every design option available to you so you’ll have an easier time making informed decisions about your new home. Are you ready to take the next step and make your dream home a reality? Get in touch with Perry Homes Utah today by calling 801-264-8800 or leaving a message on our Contact Us page.